Dr. Raymond and Mrs. Beverly Sackler at the TAU Board of Governors, 1999. Since 1976, when he dedicated the Sackler Faculty of Medicine together with his late brothers Mortimer and Arthur, the support of Dr. Raymond Sackler for TAU has been driven by a vision and personal dream – “to keep Israel at the forefront of the international community of science and scholarship and to put Tel Aviv University on the world map.” With keen insight into the University’s potential from the outset, Dr. Sackler and his wife, Mrs. Beverly Sackler, have staunchly promoted growth, mainly in the sciences, and have contributed immensely to shaping intellectual life on the campus. The Sacklers’ vision for Tel Aviv University as an international hub of academic excellence has been realized through a myriad of programs. The Mortimer and Raymond Sackler Institute of Advanced Studies, a framework modeled on Princeton’s Institute of Advanced Studies, brings world-class scholars, including Nobel laureates and prominent scientists, to TAU to lecture in the humanities, arts and sciences. The Raymond and Beverly Sackler Program for Senior Professors by Special Appointment was also designed to associate TAU with leading international scientists and scholars from across the academic spectrum. The impact of these high-profile visiting professorships on TAU students and faculty is substantial and has led to important academic collaborations. In 2011, the Sacklers established the Raymond and Beverly Sackler Harvard-Tel Aviv University Astronomy Initiative. 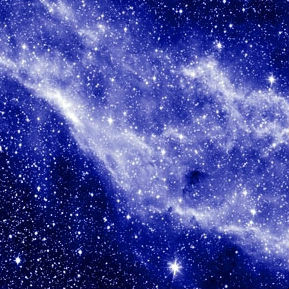 A joint collaboration between TAU’s Raymond and Beverly Sackler School of Physics and Astronomy and the Institute for Theory and Computation at the Harvard-Smithsonian Center for Astrophysics, the initiative focuses on the study of cosmology, galaxy, evolution, high-energy phenomena, stars and planetary systems. The program is yet another manifestation of the Sackler ethos at TAU – unstinting generosity focused on quality, excellence and international cooperation. Oz also proudly notes that faculty members have received some of the most prestigious awards in science, including nine Israel Prizes, seven EMET prizes, three Wolf prizes and more than 10 Israel Defense prizes. 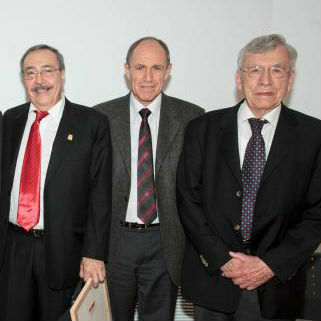 In addition, the US National Medal of Science was presented by President Barack Obama in 2010 to Prof. Yakir Aharonov for his discoveries in quantum mechanics. “Aharonov’s research, together with that of Prof. Joshua Jortner in chemistry and the late Prof. Yuval Ne’eman in high energy physics, positioned the faculty at the vanguard of science,” says Oz. Two chairs in honor of Ne'eman and Jortner were endowed by the Sacklers at the faculty. 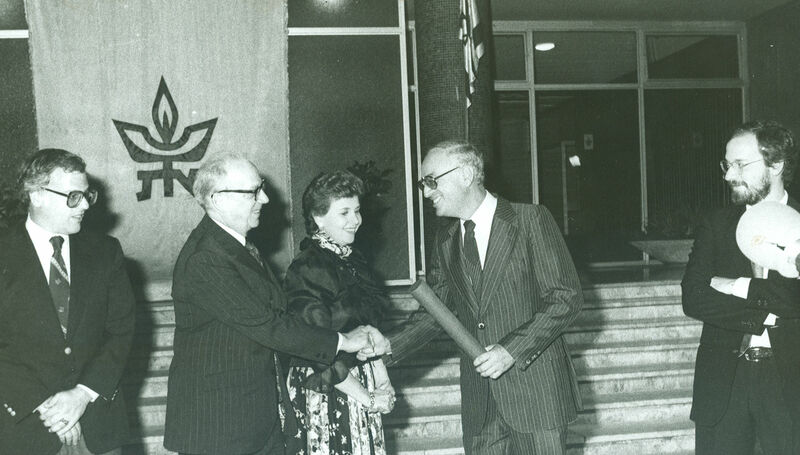 Pictured: Dr. Raymond and Mrs. Beverly Sackler (center) at the 1982 dedication of the Raymond and Beverly Sackler Faculty of Exact Sciences together with then TAU President Prof. Haim Ben-Shahar and sons, Dr. Richard S. Sackler MD (left) and Mr. Jonathan D. Sackler. As part of their vision, the Sackler family established two large international prizes at the faculty: the Raymond and Beverly Sackler International Prize in the Physical Sciences and the Raymond and Beverly Sackler International Prize in Biophysics. The cash award of the latter was increased this year to $100,000. The prizes reward outstanding science, originality and excellence among young scientists and have succeeded in identifying some of the worlds’ most promising academic talent, such as 2004 recipient Prof. Adam G. Riess, who won the Nobel Prize in Physics in 2011, and 2004 recipient Prof. Andrea M. Ghez, who won the 2012 Crafoord Prize in Astronomy, the equivalent of a Nobel Prize in that field. The Sackler Faculty of Medicine, which the Sackler family dedicated in 1976, has become Israel’s leading center for medical education and research and the only medical school in the world to offer three teaching tracks simultaneously: the full six-year medical track, a four-year track for graduates in life sciences, and the New York/State American Program for training North American doctors. “The new four-year program was developed to respond to Israel’s growing demand for more physicians,” says Dean of Medicine Prof. Yoseph Mekori. 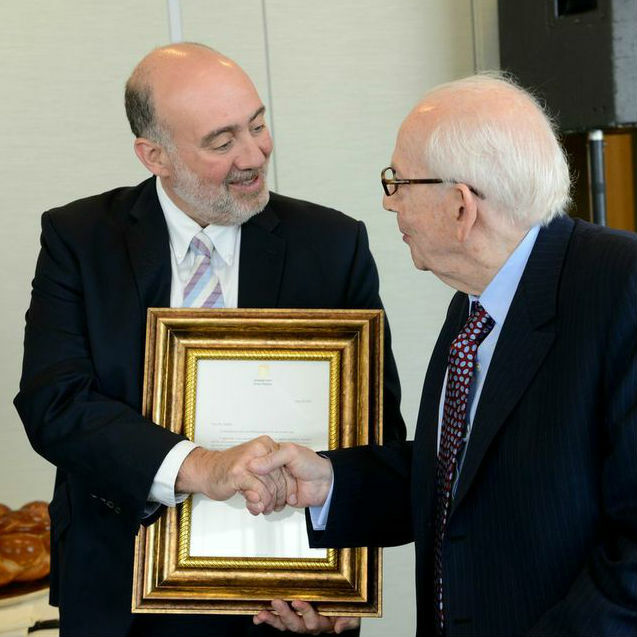 The Sacklers’ generosity has played a major role in the success of the Sackler Faculty of Medicine’s flagship international MD program, the New York State/American Medical Program, which is taught in English and accredited in the United States and Canada. The first of its kind in Israel when established in 1976, the program has trained 1,500 American doctors to date, many of whom have gone on to fill senior positions at top American medical centers. "The program is a vital component in building academic and medical bridges between Israel and North America," says Dean Mekori. One of the Sacklers’ most recent contributions to the Faculty of Medicine is the Sackler Cellular and Molecular Imaging Center, an interdisciplinary framework enabling scientists and clinicians to use and develop state-of-the-art imaging technologies for the study of disease progression in living cells. The center is headed by Prof. Ilan Tsarfaty. Other donations to the University include 10 chairs, among them the Raymond and Beverly Sackler Career Development Chair aimed at supporting new faculty members. TAU's drive to hire the most outstanding young Israeli scientists and scholars – a top priority – has met with exceptional responsiveness by the Sacklers, who have given a number of substantial gifts in recent years for recruitment in the field of biophysics. 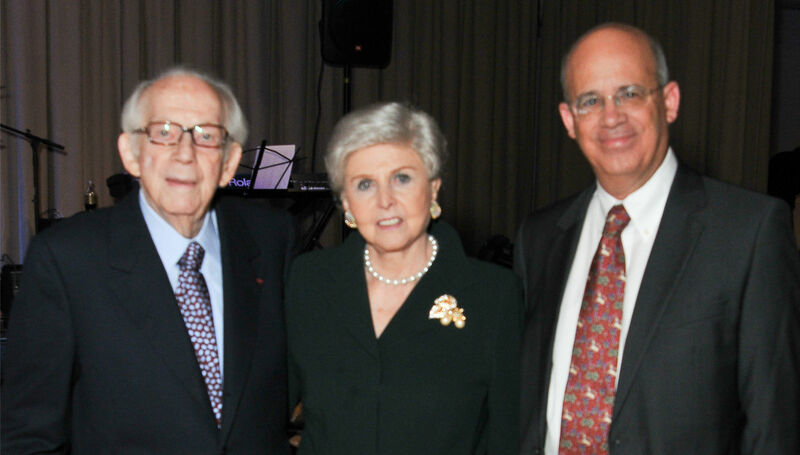 Pictured: Dr. Raymond and Mrs. Beverly Sackler join TAU President Joseph Klafter at a gala event held by the Alumni Association of the Sackler School of Medicine New York State/American Program in New York, October 2010. Dr. Sackler is a physician, entrepreneur and philanthropist. Early in his career, he, together with his two brothers, Arthur and Mortimer, engaged in research in the patho-physiology of schizophrenia and manic depressive psychosis. He received his Bachelor of Science degree from New York University and doctor of medicine degree from Middlesex School of Medicine. Dr. Sackler is a diplomate of the American Board of Psychiatry and Neurology and a Trustee of New York University Medical Center. He is a Life Fellow of the American Psychiatric Association and an Honorary Fellow of the Institute of Astronomy at the University of Cambridge. Dr. Sackler was awarded the Chevalier de la Legion d’Honneur (France) and Knight Commander, Order of the British Empire. Beverly Sackler has received an honorary degree of Doctor of Humane Letters from the University of Connecticut, is an Honorary Member at Christ’s College and at Magdalene College, University of Cambridge, and an Honorary Fellow at the Institute of Astronomy, University of Cambridge. The Sacklers have two sons, Richard S. Sackler, MD, and Jonathan D. Sackler. The Sackler’s numerous philanthropies include support for galleries and wings at the Metropolitan Museum of Art and the British Museum, the establishment of laboratories and programs at several American and British universities and research centers, and funding for archaeological projects in the Middle East. Prof. Joseph Klafter, President of TAU and himself a member of the Raymond and Beverly Sackler Faculty of Exact Sciences, says that "Raymond is more than a benefactor. He is a friend and adviser. Beyond everything, Raymond believes in the medical and scientific potential of the State of Israel, and he continues to do everything in his power to build up the University's capabilities."